The Class of 2015 counts members from as far away as Arkansas and Zimbabwe, but this year’s graduates also include five young men and women who attended Edward Little High School, Lewiston High School, and Saint Dominic Academy – the largest number of Lewiston-Auburn students in any graduating class in recent memory. It’s not unusual for young people to want to put some distance between where they grew up and where they go to college. In Maine, researchers have noted that approximately half of the state’s college-bound high schoolers opt for an out-of-state college. So why then did these five standout students choose Bates when they had their pick of colleges and universities elsewhere? 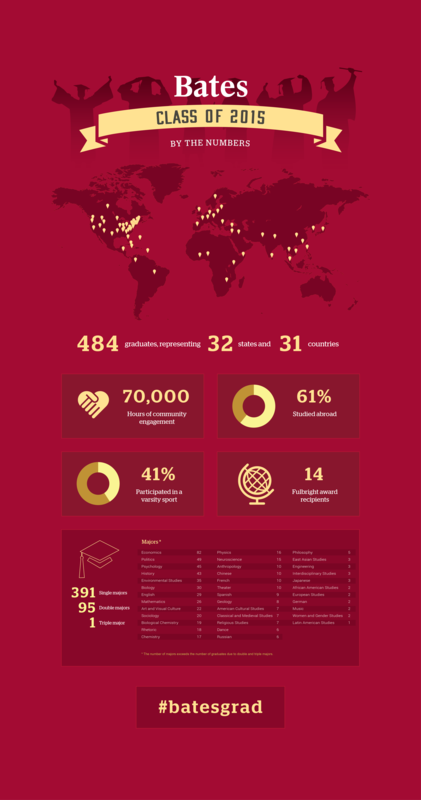 Their reasons resemble those you hear from students from all over the country and the world who choose Bates: our unique sense of community, generous financial aid, and a rigorous liberal arts education, for example. But there were other reasons too, such as a desire to continue an athletic career or the security of having a built-in support system of local friends and family. 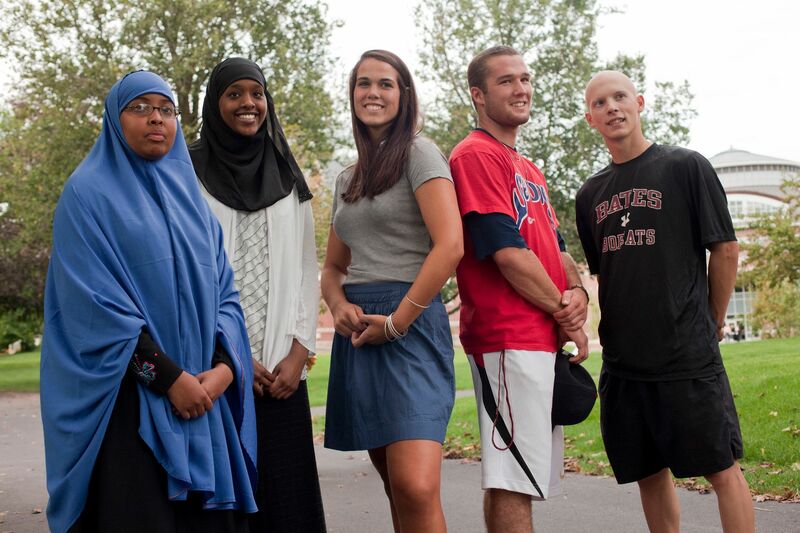 Asha Mohamud said the opportunities Bates offers rival those of much bigger colleges, which made choosing to go school close to home that much easier. 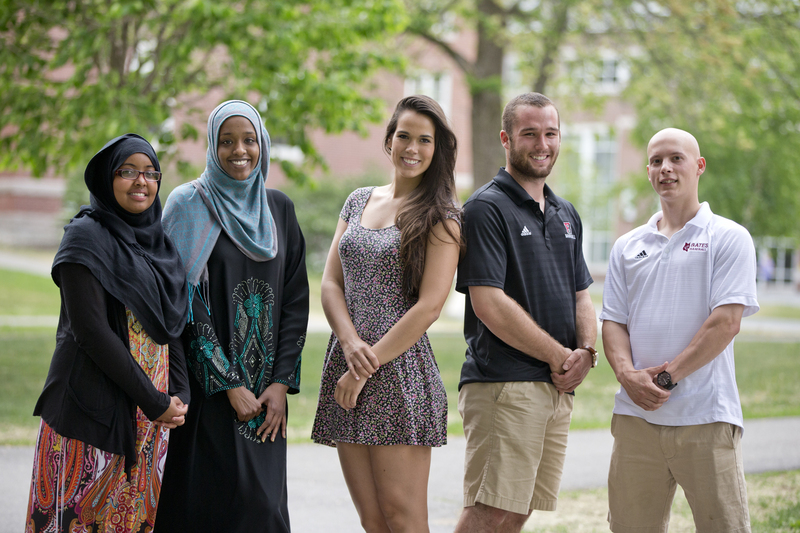 Mohamud attended Lewiston public schools and so she knew from her years of interactions with Bates student tutors that the college attracts young people with traits and ideals that appeal to her. Leigh Weisenburger, the college’s dean of admission and financial aid, is leading the college’s more focused outreach and recruitment at local high schools, exposing more Lewiston-Auburn and Maine students to the liberal arts and the diverse opportunities that await them close to home. Next September, for example, Bates is sponsoring a Lewiston High School aspirations coordinator’s travel to and participation in a national conference on college admission and counseling. In addition to the five local seniors, there are about a dozen other Lewiston and Auburn natives enrolled at Bates. They are among the more than 175 Maine students attending the college, roughly 10 percent of the student body. Collectively, the Maine students receive more than $5 million in financial aid, scholarships, and grants from the college. Alex Parker, a Lewiston native and St. Dom’s graduate, chose Bates because the college offered him the chance to continue playing baseball while pursuing a liberal arts education. Financial aid was also a big factor, he said. “Bates has so much to offer — a diverse curriculum with amazing professors, a strong school culture of inclusiveness, pride, and supporting each other, a beautiful campus and a great dining hall, and an athletics program that has grown each year I have been here,” said Parker, a politics major and All-Academic NESCAC honoree in baseball. Allania Murphy said she too found the college’s diversity inspiring and educational in ways she did not anticipate. “Becoming friends with kids from all around the world and from all different cultural, religious, racial, and socio-economic identities and backgrounds has opened my eyes to so much that I never realized or was exposed to growing up in the Lewiston community,” said Murphy, who graduated from St. Dom’s in Lewiston and played three years on the Bates women’s basketball team. When Auburn’s Naima Qambi was considering colleges, she initially thought Bates was just too close to home. She changed her mind after participating in one of the college’s visit programs where first-generation college-goers spend several days and nights on campus experiencing everything Bates has to offer. None of the local students graduating Sunday say they regret going to college so close to home. If anything, it enhanced their college experience and provided welcomed support systems.